Property 7: Lovely Cottage with terrace and panoramic view. Garden, BBQ and Pool. Property 14: Restored Mill, riverside, private pool, WIFI, romantic! Romantic, well equipped house to feel good! Property 18: Romantic, well equipped house to feel good! Property 36: Romantic Stone Cottage With Private Gated Pool In Riverside Location . 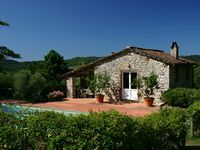 Stunning traditional Tuscan country house in Versilia with sea views. Property 38: Stunning traditional Tuscan country house in Versilia with sea views. Property 39: Casa Matilde. Family Home for 3-4 guests. Private Pool. Cozy, garden solarium, sea amazing views, air cond., washer- Lucca Pisa. Property 42: Cozy, garden solarium, sea amazing views, air cond., washer- Lucca Pisa. 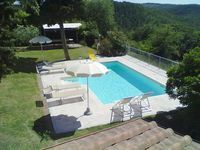 Modern Cottage with Pool & Sun Terraces in Bagni Di Lucca. Property 43: Modern Cottage with Pool & Sun Terraces in Bagni Di Lucca. We had a wonderful time at Podere Consani. It&rsquo;s off the beaten path but close enough to Lucca for dinner and great for day trips to the coast, The grounds are gorgeous and Susan, the host, was gracious. We would definitely come back! We stayed here for 5 nights and had a great time. It was centrally located in Tuscany. Plenty of restaurants within a couple miles. Six adults stayed in the smaller unit and we had plenty of room. There is a nice covered patio out back and a fully furnished kitchen. The only downside was a washing machine that was very confusing and did not work all that well. The trash was kind of confusing too, with 4 different bins. We would definitely stay here again.